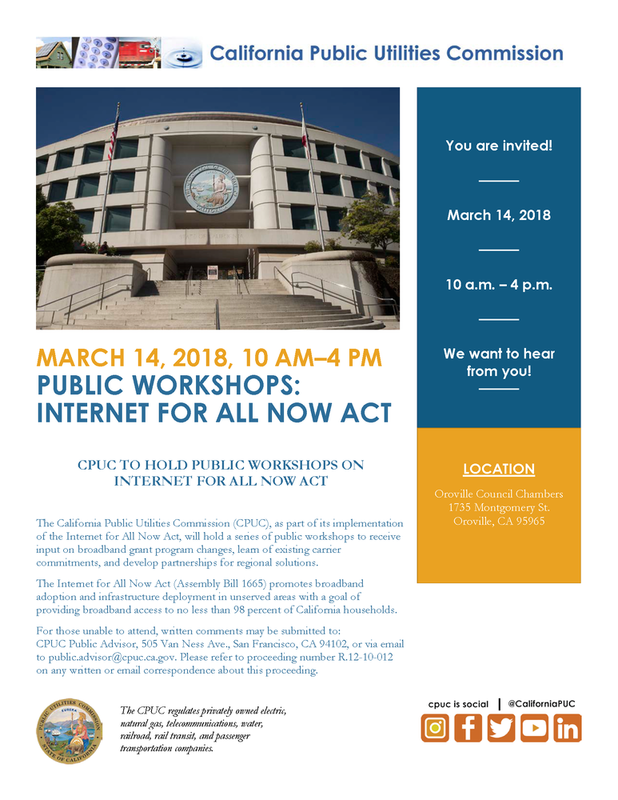 California Pubic Utilities Commission invites you to a public workshop on "Internet for All Now Act"! The California Public Utilities Commission (CPUC), as part of its implementation of the Internet for All Now Act, will hold a series of public workshops to receive input on broadband grant program changes, learn of existing carrier commitments, and develop partnerships for regional solutions. The Internet for All Now Act (Assembly Bill 1665) promotes broadband adoption and infrastructure deployment in unserved areas with a goal of providing broadband access to no less than 98 percent of California households. CPUC Public Advisor, 505 Van Ness Ave., San Francisco, CA 94102, or via email to public.advisor@cpuc.ca.gov. Please refer to proceeding number R.12-10-012 on any written or email correspondence about this proceeding. The CPUC regulates privately owned electric, natural gas, telecommunications, water, railroad, rail transit, and passenger transportation companies. You can also find the California Public Utilities Commission (CPUC) on Twitter, Facebook, Instagram, Youtube and others.